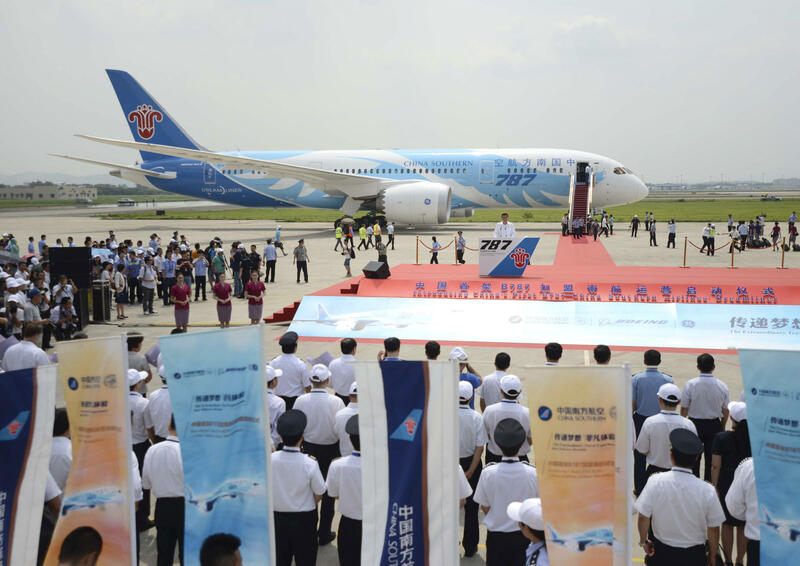 FILE: In this photo released by China's Xinhua News Agency, a ceremony to mark introduction of a Boeing 787 passenger jet by China Southern Airlines is held after its arrival in Guangzhou, capital of south China's Guangdong Province, Sunday, June 2, 2013. This was the first Boeing 787 Dreamliner obtained by China, Xinhua said. In China, some people believe tossing a few coins can bring good luck—a way of securing blessings. But that depends on where you toss the coins—and recently there’s been an alarming trend: air travelers throwing coins around the engines of airplanes. Last week, a young father was detained at the Wuhan airport—in Hubei Province in eastern China. He said he threw a few coins off the jet way because his four-month old daughter was making her first flight---and he wanted a safe journey. He also blamed his mother in law—saying it was her idea. It’s a disturbingly common idea—that tossing a few coins in or around the engine of an airplane will insure a safe flight. In fact, as a number of Chinese regional newspapers are reporting, the results are often exactly the opposite. Nearly two years ago, an 80-year old woman tossed a few coins into the engine of a China Southern Airlines plane at the Shanghai airport—leading to a five-hour flight delay---and causing about 150-thousand dollars in damages to the engine. There have been at least two other cases in recent months of people flinging coins into or near engines of airplanes. That’s led to delays in flights—and airline officials are now looking to prosecute people who are a bit careless in their pursuit of good luck.